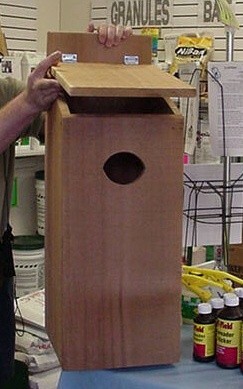 WOOD DUCK HOUSE: This large Wood Duck House is made to conform to Federal guidelines when duck houses are needed for areas designated as "wetlands". 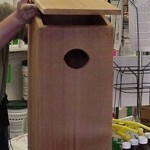 These are designed with both comfort and longevity in mind built with galvanized metal and cedar. These houses measure 32 inches tall, 11 inches wide and 13 inches deep. The are constructed with galvanized screws, have the metal screening up front, come with sawdust and have the flange mounted on the bottom for 1 1/4 inch threaded pipe. This allows you to mount the pipe on a pole which is easy to adjust so the house can be moved up and down as needed to get it to the right height. The top on this design comes up and is kept in place with a metal hook located on the side of the roof. These houses are built to last; expect to get many years of life from one. However, you may want to purchase just one to see if it meets with your local agents approval before you have us make several only to find your agent wanted them an inch wider or taller. If you have a need for many houses but want to first make sure it will comply, buy just one and let the agents review it for to see if they want any changes made. Forward this information to us and we can custom make a batch accordingly. Though the production may take 2-4 weeks, depending on adjustments and quantities ordered, we are prepared to make them to spec.